Missing Person: Jolene Rooker, 71, female, white, 5'0, 170 lbs. Last seen: Wildwood Canyon Park in Yucaipa on 9/10/17 @ 1pm. The Calimesa Police Department is seeking the public’s assistance in locating 71-year-old Jolene Rooker. Mrs. Rooker resides on the 300 block of County Line Road in the City of Calimesa. Jolene Rooker was last seen at the Wildwood Canyon Park in the city of Yucaipa, where her vehicle was located. Mrs. Rooker is described as a white female adult with shoulder length blonde hair, blue eyes, 5’00” tall, and weighs 170 pounds. Mrs. Rooker was last seen wearing dark blue jeans, white plaid shirt, and blue/black shoes. Mrs. Rooker was carrying a dark blue backpack. The Aviation Units from both the Riverside County Sheriff’s Department and the San Bernardino County Sheriff’s Department along with deputies from both Departments were used to search for Mrs. Rooker. 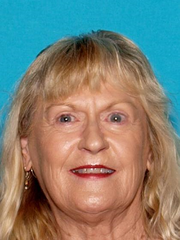 This is an active investigation and anyone with information regarding the whereabouts of Mrs. Rooker is urged to contact Master Investigator Thomas with the Riverside County Sheriff’s Department at (951) 922-7100. Please dial 911 if located.